Boris Rauš 8. 10. 2015. To a former developer and currently a successful entrepreneur, WebCamp is an ideal conference due to its combination of advanced IT lectures mixed with non-tech ones. Any person communicating with another person in his life could’ve found a certain value in “Why should you talk” talk presented by a German developer and author (of programming books, of course), Christian Grobmeier. Due to its distinctive name, this year’s WebCamp “Talk” talk really got my attention. Firstly, quotation marks draw one’s attention while reviewing two tracks at the same time. Secondly, I found repetitiveness of the word talk very charming. 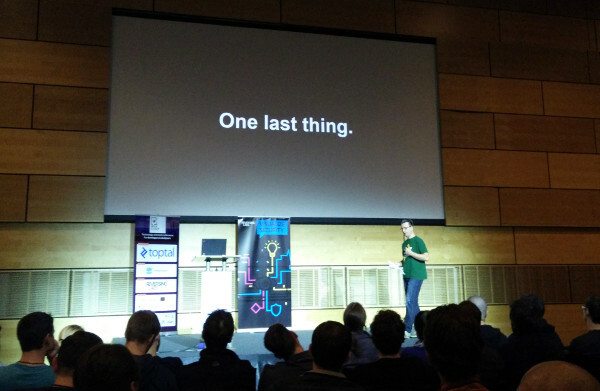 This kind of talks during IT conferences are either a complete disaster or a hit. 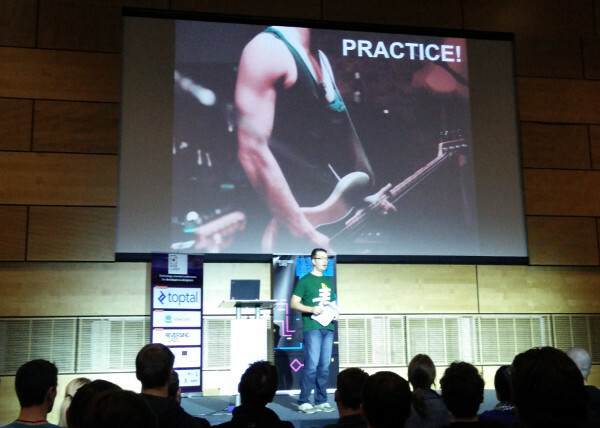 In this case it was a hit mostly because the real value of the talk lies in the experience of the speaker – the developer who is talking about how to speak. 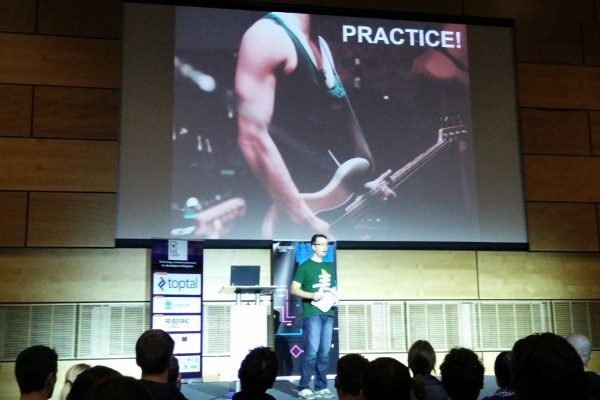 Because Christian has been a member of the audience, he also asked himself how speakers had the guys to go on stage – which resonated with the audience at Webcamp Zagreb. The first message pointed out by our speaker is that mistakes and omissions are acceptable. The world’s become fast and information even faster. Because the world has become fast and information even faster, what worked yesterday doesn’t work today. It’s the same with your talk – it’s happening now and it should be your main focus – now! Most people can’t handle the adrenaline rush and can’t relax completely. Yes, you will experience stage fright and, yes, you might not have an answer to every question. But it’s worth trying because it helps you grow and improve your communication skills. ?? While preparing to speak publicly, right at the very first stage, you are adding a value to yourself. You may think of something you had forgotten, as well as learn new things and gather new information at this stage. While talking, you are sharing knowledge and experience with your audience, and directly adding value to them as a speaker. In order to find the right value for yourself and listeners, you need to know yourself and audience very well. The key of quality knowledge transfer is to find out what is your peculiar expertise for a specific audience. You don’t need to be the top expert in a field you’re talking about, you just need to be the right girl/guy for your audience. Through lectures and talks, you position yourself as an expert in a certain field. Other than the fact that it sounds cool and tempting, there are other rewards. First of all, you get to know new people – other speakers, audience, and organizers. Every contact is potentially a new business lead, and it could be useful in the future. Through networking you build your reputation and differentiate from competition with similar knowledge. But hey, your competition doesn’t do talks and they’re not interested in speaking publicly. They just sit in their offices. This article is an outstanding translation by Netokracija’s exclusive translation partner, Language House. The original Croatian article is available at “Zasto bi svaki developer trebao držati predavanja“! Boris Rauš is the co-founder of the web development and marketing agency BambooLab. Besides sailing the entrepreneurial waters, he enjoys traveling around the world. Boris is also an IAESTE international coach for creative thinking, motivation and association management. He enjoys experimenting with cooking and eating, collects comic books and holds his collection in a secret location.